Supply and installation of Air Compressors and Air dryers ( Ingersoll Rand/Atlas copco) Installation of MS, GI & Aluminum Pipe Network, Preventive Maintenance of Compressors/Dryers. GEM EQUIPMENT LTD offers a complete solution to Compressed Air Problems. GEM is poised to grow and expand internationally as a supplier of Quality Compressed Air Dryers and Compressed air contamination removing systems. We are indulged in manufacturing, supplying and trading a wide gamut of Refrigeration Air Dryers. To manufacture these dryers, we do not compromise with quality and make sure that qualitative material is brought into use. The range we offer can be availed at reasonable rates. With sincerity and hard work of our experts, we have carved a niche for ourselves in this domain by offering Refrigerated Air Dryer. A compressed Air dryer is a device for removing water vapor from compressed air. Compressed air dryers are commonly found in a wide range of industrial and commercial facilities. We are offering Compressed Air Dryer to our client. Plant Capacity: 1 - 10, 000 NM³/Hr. 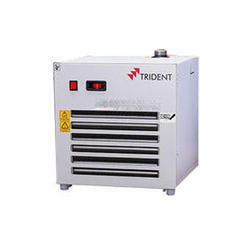 Product Specifications: Capacity : Upto 10, 000 NM³/Hr.